The perfect wedding present: A lovely rose called 'Wedding Day' a white floribunda rose ready for planting, with full care instructions, Supplied with a bottle of Champagne to celebrate the happy occasion. 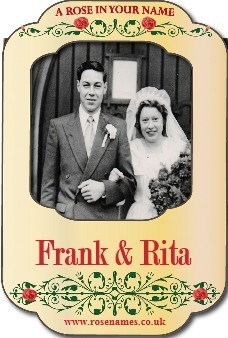 Personalise this gift with a picture of the happy couple, A unique Personal gift, it makes a lovely wedding gift, we can also print your own message onto gift tag with the date of the wedding. This comes with a gift certificate. A perfect wedding present: A lovely rose called 'Wedding Day' a white floribunda rose ready for planting.